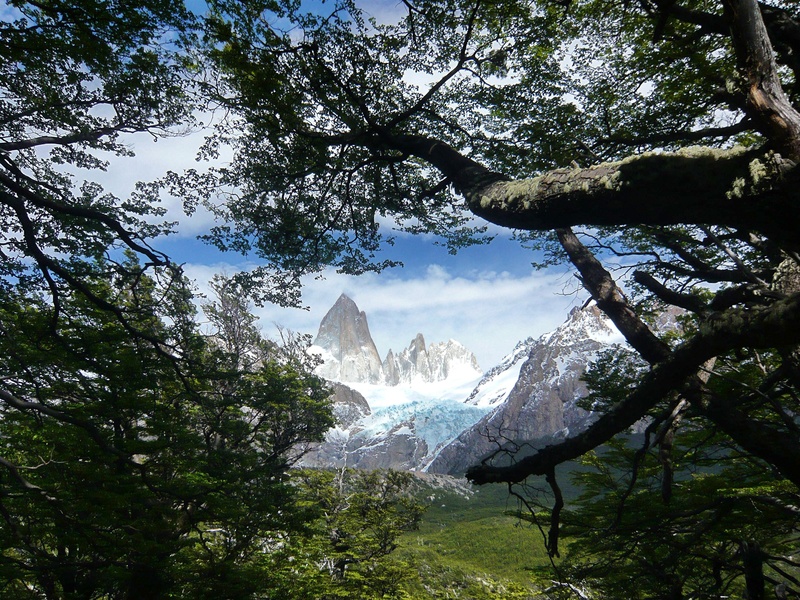 This photo was taken in November 2009 during a hike in Los Glaciares National Park, Argentina. There is something spectacular about walking through a fragrant Patagonian forest and spying a brilliant glacier through the darkness of the woods. Here in the Andes, the mountains are craggy and jagged. Glaciers runs forever and the weather is very unpredictable. This day, we had beautiful gleaming sunshine and relatively little wind which is unusual for this far south. We also had a fresh snowfall to tramp on which dotted the trail. Great shot! I remember going hiking in Los Glaciares NP in high summer (December) and being almost blown sideways by the wind… and it also snowed while we hiked, and the snowflakes felt like icy, painful awful bullets pelting into our skin… aaah good times in South America! Love your photos – have followed! Happy trails.